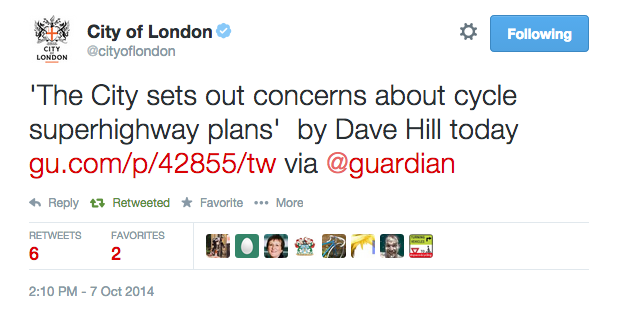 Earlier this week, the City of London published its report on the Cycle Super Highways. I'm going to analyse the report below. But before I do, I want to point out something that is probably more important than the City's inner workings. And that is something quite impressive. 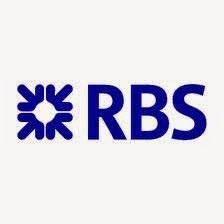 Thanks to the stirling work of the Cycling Works team, we now know that Royal Bank of Scotland has written to the Mayor in support of the Cycle Super Highways on behalf of its 12,000 employees in London. The phone giant Orange has done the same. And Unilever, the Anglo Dutch corporate giant has written a very personal account of why it wants the Mayor to build the Cycle Super Highways: "We have tragically lost employees in the past who have been killed while trying to cycle to or from work. We do not want to lose any more." I have even had a note from the Dutch ambassador saying she intends to write to the Mayor as well. Meanwhile, I now know that Canary Wharf Group is meeting all sorts of people about the Cycle Super Highways. This follows an anti-cycling briefing note which was being distributed by people linked to Canary Wharf Group and a very clear reference to the backroom antics of (what is probably also) Canary Wharf Group in last week's Evening Standard by a TfL board member. On the one hand, we have major companies like RBS, Unilever and Orange showing social responsibility to their staff. On the other hand, it seems pretty likely, we have Canary Wharf Group. And then we have the City of London. Now, I find it rather odd that the City is putting out twitter statements like the one above. And I say that because the actual content of the City's internal report is much more balanced than this sort of "shock jock" twitter commentary, which is rather unusual to see from the Square Mile's twitter account. First the context: The briefing note that has been handed out by people linked to Canary Wharf Group, is all about maximising central London for private motor cars. And, frankly, sod everyone else. But the City of London's report is very different. The core focus of the Square Mile shows that City of London politicians are completely opopsed to the sort of thinking being displayed in that briefing note that has been handed out by people linked to Canary Wharf Group. What the Square Mile is saying is that it wants to make its part of central London work better for pedestrians. Not for private cars. A key element of the City's report is that pedestrian crossing times need to be improved and it worries they will be made longer by the cycle highways. "A reduction in wait times are needed rather than increased or at worst they should remain the same". Actually, I can't disagree with that (although the grammar is rather odd). "Over the last decade or so, pedestrian wait times at signal crossings have gradually increased. These increases have been made by TfL in order to maintain capacity for motor vehicles. It involves increasing signal cycle times which means it will take longer for the “green” man to appear. This also means that many pedestrians now ignore the “green” man and cross when they can, again increasing road danger." In other words, under this Mayor and the previous Mayor, TfL has tried to squeeze in cycle facilities and pedestrian facilities. But it has done this by insisting on maintaing car capacity. Now this gets a tiny bit technical but please please read this because it's important. You simply cannot maintain capacity for motor traffic and also fit in space and time for safe cycling and safe walking. It just isn't possible unless you build a gazillion new roads. This is why Chicago's Mayor stood up and pledged a goal of ZERO road deaths within 10 years. How's he planning to do that? He's going to focus on making the roads safe enough for "even the most vulnerable – children, elderly, and persons with disabilities – [to] travel safely within the public right of way.” You cannot do that without restricting motor traffic. And the implication of the City of London report, although it does not say this directly, is that TfL needs to start reducing motor traffic in central London more than it has in the last decade. It is absolutely right about this. And Canary Wharf is, in my opinion, absolutely wrong. There's a lot in the City's report I just don't agree with. There are parts in the report where I think the City is being plain cheeky. It appears to be asking for TfL's cycling money to be spent on a new pedestrian link to a new boat pier at Blackfriars. It makes some rather cynical comments about Blackfriars junction. I can't help but feel quite angry, for example, that the City meekly approved the current Blackfriars junction design a few years ago (despite significant public opposition) that it now describes as "confusing" and as having a "high collision" rate. But people, and local authorities, are allowed to change. That said, the general direction of the City's report is not bad. The City is clear that it wants to support the Mayor's cycle super highway plans. But it quite rightly wants to stand up for the majority of its road users who are on foot. Now, when it comes to Upper Thames Street and Embankment, the majority of road users are not on foot. Because much of this route is a traffic-snarled, nasty environment. And the City's report does rather cynically mix up sections from one super highway plan with another in order to present a 'worst case' scenario at points. But if you go with the overall impression of the City's report, it is about supporting the Cycle Super Highway plans but seeking to ensure benefits for pedestrians as well. I'm quite ok with the principle of that and I think most people would agree. I'm afraid I can't say the same for what Canary Wharf Group seems to be up to.